In our ever noisier society there is a growing desire for silence. Many travellers are looking for silent locations, but also for silent spots in busy environments like big cities. The Quiet Room® label is the first and only objective certificate for quiet hotel rooms. Hotels that carry the QR label, guarantee that you will spend the night in a room that is well-insulated against noise pollution. Most of these hotels have 4 or more stars. 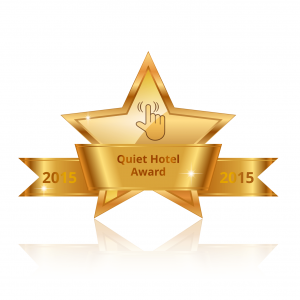 In 2015 the first Quiet Hotel Awards have been awarded. The Quiet Room® label is an initiative of the Knowledge Center Sound Insulation(KGI). KGI checks and certifies hotels for the QR label. More information about the QR label can be found here. Our goal is to inform travellers, both on holiday and on business, as precisely as possible about hotels with silent rooms in Europe and elsewhere. To this aim we will regularly publish an updated list of hotels carrying the Quiet Room® label. Would you like to be informed on a regular basis about the QR-label and be the first to know about new hotels on the list? Register for our newsletter.